The year 2015 marked a turning point for the millennial generation. Their numbers eclipsed those of baby boomers as a whole, and they now outstrip Generation X in U.S. workplaces. Without a doubt, millennials will be the generation of influence for years to come. What does that mean for employers? Among other things, they could be facing more turnover than ever before. Millennials already have a reputation for job-hopping, and it appears that they as a group will be keeping an eye toward future prospects. Two-thirds plan to leave their current workplaces by 2020 for new opportunities, according to a survey by Deloitte. Their reasons for leaving are varied, but one in particular stands out: Many feel their employer overlooks or underappreciates their skills and contributions. What’s more, 71 percent of those who plan to leave have said their employer has shown no interest in developing their leadership skills. How can employers communicate the value of their team members? One powerful yet simple way is to offer tangible rewards that let them know their hard work is noticed and appreciated. Here are three things to keep in mind as you put together your stash of incentives and get the positive vibes flowing. As you know, we have moved well past the trend of handing out cellphones for work and into the era of BYOD — that is, bring your own devices. 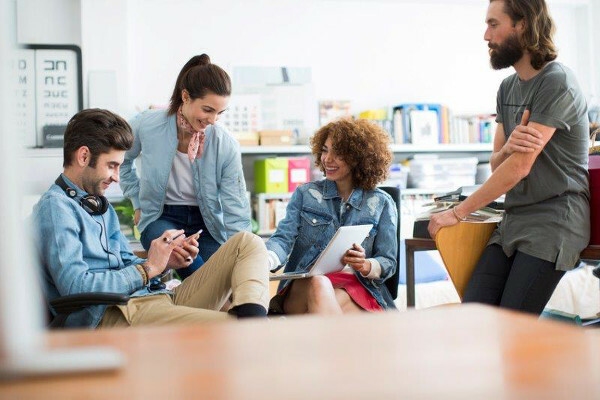 Tech-native millennials increasingly prefer to access work platforms from their own laptops, tablets, and mobile phones, rather than toting around multiple electronics. With that in mind, what is more likely to resonate with a new employee today is a positive opening statement on his or her first day of work that says, “We’re glad you’re here!” Offer an array of onboarding gifts, including items like a commuter mug, a water bottle, a power bank, a flash drive, and, of course, a nice pen. Check in once in a while to get a sense of their likes and needs. Design a survey with a mix of multiple-choice and open-ended questions. If you offer rewards your employees really want — say, a new high-end backpack for their anniversary gift — the gesture will mean that much more. Whether he raised his hand to tackle an extra assignment, or she convinced an unhappy client to stick with your company, an employee who’s gone above and beyond the call of duty deserves some positive feedback. One way to make these moments stick is to offer a reward. Maintain a stock of small prizes so supervisors have an easy opportunity to recognize excellence in daily work. Useful, totable gifts will make a great impression, such as a utility knife or LED flashlight. When an employee receives a gift from you, it creates positive feelings. When that gift bears your logo, the gesture goes even further, as it sends a poignant reminder that you do notice and appreciate the talent and hard work they bring to the team and the organization. With out lineup of HR Gifting Solutions, we can help you find the perfect incentives and rewards to help you spread the love.